Everything was played on digital clocks. Each of the players could choose where to sit, and in the case both teams wanted to play against concrete opponents, it was randomly determined before the games which team could sit first. As a special price for all buggers in both days was CD with 20 000 bughouse games (classic DB 1998-2000 in both formats and 2002 year played by buggers over 2100 and some special selections in .bpgn format) and all the bughouse software found on the internet and infos. We hope now everybody has all for playing bughouse both OTB and on the net. On Saturday the singles tournament with changing partners was played. The winner was awarded with special trophy : battle pawn. It was played using "Z-system" (shortly: players are sorted after each round based on points and progress, then the first four make up group A, next four group B etc. Then the games are played in each group, so that player seeded #1 partners seed #3 and plays against #2 and #4. In group A however, #1 partners #4 and plays against #2 and #3. We played 20 two-game rounds, after which the first five players advance to the finale to compete for the 1st place. The finale was played each versus each one game (15 combinations). The points from basic part of tournament were not counted in the finale. The basic part of the tournament was won by Matejus (Martin Tajovsky from TJ Slavia Hradec Kralove), who is nr. 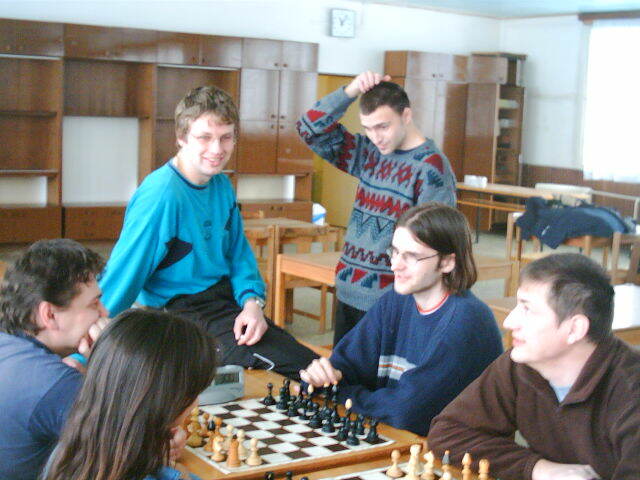 1 in Czech Republic OTB bughouse chess rating list (based on all official tournaments played in the year 2002 in Czech Rep., including matches versus Fermy+CreepingDeath team). Finale was won by Alamar (Jiri Jezbera, also from TJ Slavia HK, at present the player with highest best on FICS among the czechs.) Congratulations to the trophy pawn :) Ivanek (third highest best czech on FICS) played first time over the real chessboard so he only warmed up. In finale B (everyone wanted continue in bughouse, only Prymula and Katerina gone home) was first SKAcz before Sandokanom, Ivanek. 1. Jiri Jezbera (Alamar on FICS), Hradec Kralove, 8 points from 12 finale games. 2. Martin Tajovsky (Matejus on FICS), Hradec Kralove, 7 (12). 3.-5. Ondrej Pridal (not on FICS), Brno, Tomas Kulhanek (not on FICS) and Josef Jiruse (Jiruse on FICS), both Hradec Kralove. On Sunday there were 3 team tournaments played. In the first round Wir+Countryman scored 1-3 against the favorites Matejus+Jiruse, which could be considered surprise. However this team played not very well and finished third. The addition game for the first place was played between Ivanek+SKAcz and Alamar+Sandokanom teams, (1-0), so Ivanek wons his very first OTB tournament. In the second tournament the best team in the Czech Republic Alamar+Matejus dominated: they won all the games (20 of 20). After the tournaments additional match was played between Alamar+Matejus and Ivanek+SKAcz, 10-0 was the result. Ivanek+SKAcz were second and Jiruse+Wir third in the second tournament. It seems that at present there is not any stronger team in the Czech Rep., perhaps only Nachod winners of biggest tournament in Czech local version of bughouse (holandany) - Petr Cechura + Michal Cerha could possibly challenge this team. The third tournament was quite tight, as almost every team scored some poitns against every other - there are only 2 zeros in the entire tournament. Finally the winners were Matejus+Jiruse with considerable gap, Alamar+Sandokanom were second and Ivanek+Wir third. In saturday tournament Sandokanom partnered Katerina. In one game, Katerina - angelic girl - after his non-stop talking, she stopped him unexpectedly: "Shut up, please!". Wir partnered Ivanek and when I walked around, Wir had 3 knights on the board already, though he still waited for the fourth and asked repeatedly: "Can you give me the knight please? I need knight". When I walked around several minutes later, I heard him again: "Knight?" So Ivanek gave him one, but then after 2 moves maybe, he asked once more: "Can You give me a knight?" I told him he needs a special chess set, where at least 8 knights of each color are present, perhaps only then he might be happy. Alamar partnered with Sandokanom is always a lot of fun. Alamar often uses Sandokanom like the bots on FICS, to play fast opening and then he starts his simul. After the opening is over it could very often be heard: "play this and this and sit", "moment", "this play and that and sit". Matejus called this team "puppet theatre". There is a slideshow made from minivideo 640x480 which shows this scene magnificiently. Jiruse Josef (HK) [Jiruse] . 1 4 2 3 4 14 3. Skaloud Dusan (HK) [SKAcz] 3 . 1 3 4 4 15 1. Krasa Marek (HK) [Sandokanom] 0 3 . 4 4 4 15 2. Kubelova Sona (Krnov) [-----] 2 1 0 . 2 3 8 4. Stursa David (HK) [Countryman] 1 0 0 2 . 2 5 5. Koros Ladislav (HK) [-----] 0 0 0 1 2 . 3 6. Jezbera Jiri (HK) [Alamar] . 4 4 4 4 4 20 1. Skaloud Dusan (HK) [SKAcz] 0 . 4 4 4 4 16 2. Krasa Marek (HK) [Sandokanom] 0 0 . 4 1 4 9 4. Kubelova Sona (Krnov) [-----] 0 0 0 . 1.5 3 4.5 5. Jiruse Josef (HK) [Jiruse] 0 0 3 2,5 . 4 9.5 3. Koros Ladislav (HK) [-----] 0 0 0 1 0 . 1 6. Jiruse Josef (HK) [Jiruse] . 4 5 5.5 6 20.5 1. Letal Ivan (Breclav) [Ivanek] 2 . 2.5 4.5 4 13 3. Krasa Marek (HK) [Sandokanom] 1 3.5 . 6 3.5 14 2. Kubelova Sona (Krnov) [-----] 0.5 1.5 0 . 2 4 5. Doubrava Pavel (HK) [-----] 0 2 2.5 4 . 8.5 4.